December. Ah, December. The last month of our project, the final chapter of the agony that has been cooking my way through the Professional Pastry Chef. This month is designated as Country desserts. For the first recipe, I chose a Fall Cobbler. The filling on this cobbler was apples, pears and cranberries. It wisely advises using dried cranberries to keep the filling from turning out a distressing red. This is, I suspect, good advice. Cobbler is just about the easiest thing on the face of the planet to make. There are a billion ways to do it, and all of them are valid as long as they’re tasty. This dessert isn’t even supposed to be pretty. “Homey” is the operative aesthetic here. So you chop up your fruit, then you mix together the sweetener and thickening agents for the cobbler. This recipe called for honey, a bit of cream, lemon juice and flour for this bit. The flavor on this cobbler was okay, but not mind blowing. I’m more partial to brown sugar instead of honey with an apple and pear filling. You can also use butter instead of the cream to get a bit of fat in, and I’ve seen tapioca instead of flour used as a binding/thickener. The lemon juice you want because the acid in it keeps the apples and pears from browning. I’ve been known to go crazy and use lime juice instead for some recipes – though I don’t think it would fly here. Make sure you mix the liquid in the fruit really well. Get it all covered. If you’ve done your proportions correctly (and even the Professional Pastry Chef got the proportions on this right) it should feel like there’s not quite enough stuff to cover all the fruit. Keep stirring. It helps to have put the fruit in a bowl that’s too big. Most of what I’m saying about cobbler here works for pie, too. Cobbler is like lazy, sloppy pie. I’m just going to take a moment to say one teeny, tiny nice thing about the Professional Pastry chef. It’s been recommending the use of a melon baller for coreing fruit this whole time. I didn’t think we had a melon baller and just used my regular fruit peeler/corer to take care of it. But I happened to spot this in the drawer and put it to work. Holy Cobbler, Batman! It’s much easier. That makes, I think, the second tip out of this book I’m pleased to have encountered. Yay! 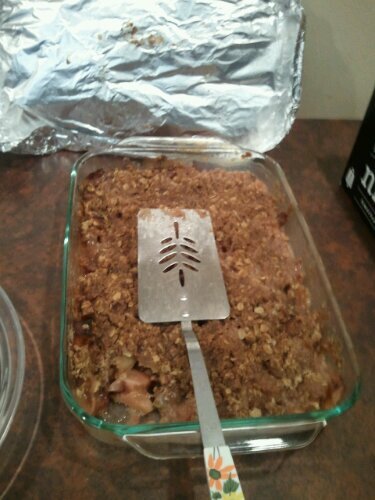 Normal cobbler crusts are basically just streusel, or some variant thereof. This recipe called for a streusel made with oats. It was. Uhm. Well, like I said, with cobbler, as long as it tastes good, it’s valid. Not a mind blowing recipe. Decent. I’d probably make something up rather than follow this recipe again, though. Wait, you don’t want your dessert filling to be a distressing red? Not accidentally, no. Much more important to have it be a color people will actually eat.